Home » Collections & Research » Museum Collections » Estelle Ishigo Collection » 8 A.M.
1 drawing on paper : ink ; 5 x 8 in. 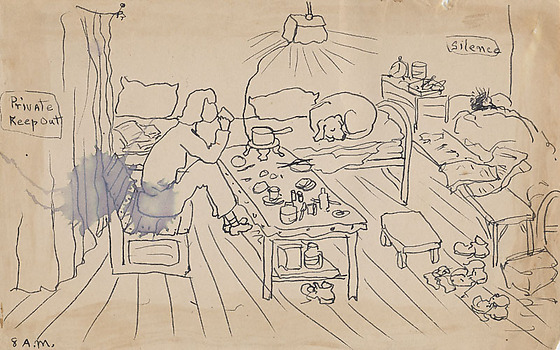 Black pen drawing of barracks interior at 8 a.m. in United States concentration camp. Woman seated in chair sips from a cup while propping her feet on a low table covered with objects including a pot on a hotplate plugged into overhead light. A curtain hangs behind her, floor to ceiling with a sign "Private Keep Out." One shoe next to table in foreground ; its mate and another pair of shoes sit at the foot of a cot next to a bed where someone is sleeping on right side. In background right, above bed is a sign "Silence" ; a dog sleeps curled up on another bed, back center. Lines indicate plank flooring. Water stain left where woman is sitting. Same content as 94.195.29M. Written in black ink, bottom left corner: 8 A.M.